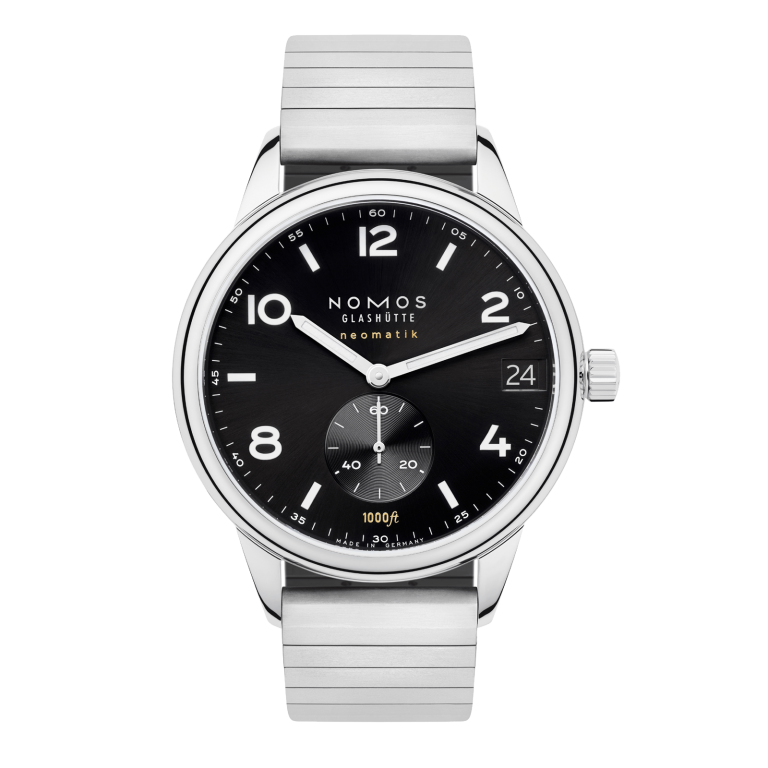 A new Club—with a thirst for adventure: This large NOMOS watch is water resistant to 1000 feet, or 30 atm. Equipped with neomatik date caliber and a new bracelet, this watch is (not just) for sporty wrists. GLASHÜTTE, MARCH 2019. This year, NOMOS Glashütte is making men happy with Club Sport, or to use its full name: Club Sport neomatik 42 date black—42 millimeters in diameter, innovative neomatik technology, just as innovative date, deep black dial. The striking digits, treated with superluminova for the best luminescence underwater, glow white. The dial is also inscribed with “1000 ft”—a reference to the watch’s diving capabilities, which of course also guarantees reliability on land. This NOMOS timepiece is more robust than any before—and not just because of its 42-millimeter diameter. The movement, in-house caliber neomatik date (DUW 6101), is protected from shock, impact, and water by its extra-strong case, sealing, and sapphire crystal glass. Thanks to the slender neomatik caliber, the watch is like a small but perfectly proportioned vault. Its strength is packed into a tight unit, since the slender movement within saves ample space in height. Club Sport also ensures security with every detail: If the crown is not completely screwed in by the wearer, a red section of tube serves as a reminder. The Club Sport will be available at Ace Jewelers starting May.